You’ll be hard pressed to find a better island for a getaway than Aruba. Interested in water sports and activities? 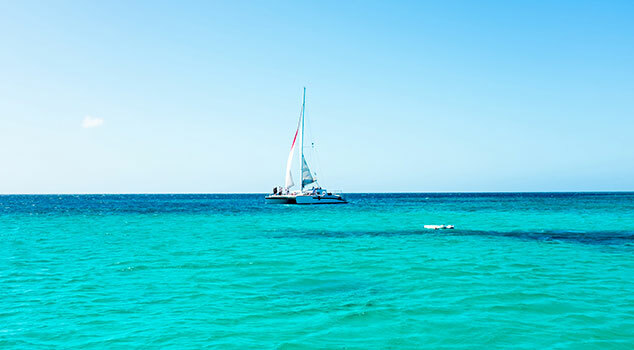 Aruba is chock full of snorkeling, scuba, fishing, catamaran and windsailing tours. Want a spot to lay the day away? Eagle Beach is often rated as a top-10 beach in the world. Throw in an eclectic Caribbean culture, fantastic all-inclusive resorts and friendly locals and you have one of the best vacation spots in the world. 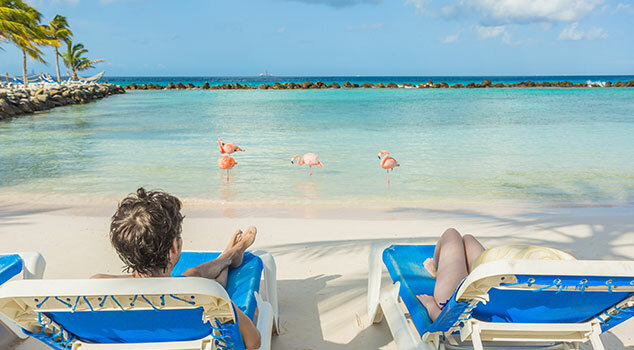 Take advantage of United Airlines® many flights to Aruba and book your vacation package today. We’ll put this simply. Going snorkeling or scuba diving in Aruba is a must. A must-must. With the Antilla shipwreck — the largest in the Caribbean — fish friendly coves and unique reefs, there’s a whole world waiting to be explored. Prepare for true beauty. 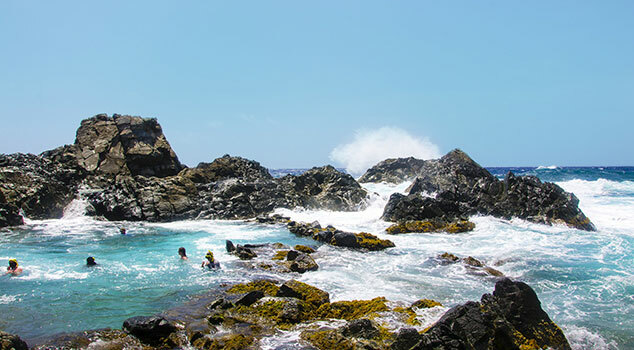 Get a true taste of life in Aruba with a trip to Arikok National Park. Covering almost 18% of the island, you can explore unique (and protected) local flora and fauna along a rugged coastline. And no trip to Aruba would be complete without a trip (or two or three or four) to Eagle Beach. Pristine white sand marks one of the most relaxing spots in the world. 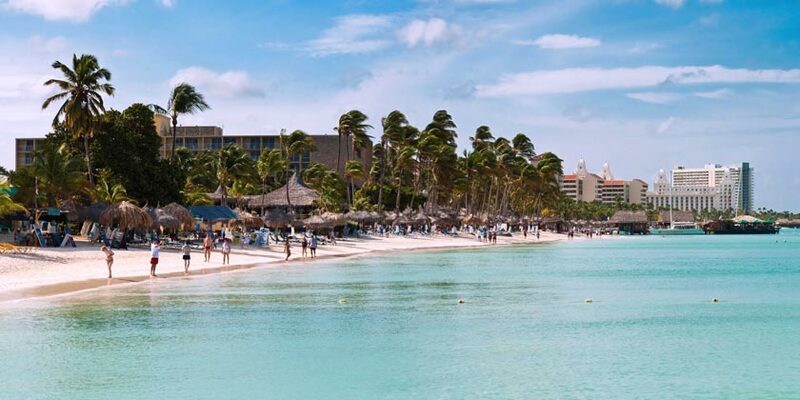 It’s always a good time to go to Aruba. With year-round 82-degree weather and a location south of the hurricane belt — which means they almost never see a tropical storm — you can look forward to day after day of sun-filled bliss. This jeep safari is the only way to reach the refreshing, crystal clear waters of the Natural pool. Take in all the pleasures of the sea by enjoying a day of sail and snorkel on the island's newest catamaran. Resort info: From the charming guestrooms to the beautiful beaches, this inspired resort exudes Caribbean flavor perfect for everyone. Resort info: Appealing to anyone seeking a great value, this pleasant resort provides oceanfront guestrooms and all-inclusive amenities. Resort info: A place for fun, sun and sand, everyone can experience relaxed island living during stays at this sunny seaside retreat. Resort info: This resort offers spacious accommodations & stunning views overlooking Palm Beach and the high rise boardwalk. Resort info: This lively beachfront resort is one of the best values for families and active travelers in Aruba. Resort info: This distinctive resort is a true island gem. Located within walking distance of the island’s most exciting shopping, casinos and nightlife. Resort info: This premiere resort appeals to luxury travelers, with its unique blend of premiere accommodations and lavish amenities. Resort info: Overlooking Palm Beach and the boardwalk, nestled amidst 14 acres of tropical landscapes, fragrant gardens, exotic lagoons and cascading waterfalls.